With over forty years of operational experience Subsea International Ltd work with customers to understand the issues found in project portfolios. We deliver innovative technologies and systems. We manage scope, sourcing, supply, provide technical support on use, quality and costs. We meet the modern day requirement for organisations to purchase as many technologies and systems from a single source to increase budget efficiency and effectiveness without affecting quality or safety. Subsea International Ltd gives you an experienced team to professionally manage and resolve the outsourcing of technologies, and systems to answer issues found in your project scope. With offshore and onshore; electronic, mechanical and multi-disciplinary project management backgrounds you can be assured of delivery in budget, on time. 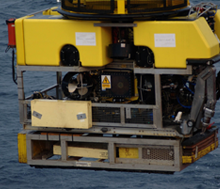 We are the EMEA agent for Deep Ocean Engineering Inc, www.deepocean.com the US ROV and ASV manufacturer operating in renewable energy, environmental, oil & gas, defence, nuclear, scientific and research, marine surveying and water sectors. We are the UK agent for Sidus-Solutions LLC, www.sidus-solutions.com the US subsea and topside camera, light, laser and PTZ manufacturer operating in the same markets as above.